A combination of classic and modern design, a perfectly accurate mix. Mr. Newson was the designer and creator of the Mille Miglia 2018’s trophy and medals keeps on adding ambitious projects to the list of his exclusive creations. In 2010 this hand models of Aquariva by Marc Newson was available for over € 1 M.
The boat is currently completely checked and updated by Riva World in the Netherlands. The boat will be ready in spring 2019. The boat will be in as-new condition! Riva, the iconic Italian boat-maker established in 1842 in Sarnico, is one of the oldest and most celebrated boat-yard in the world. Riva’s Aquariva is the natural evolution of the Aquarama, a modern day icon which reinforced Riva’s reputation as the epitome of style and luxury. The ‘Aquariva by Marc Newson’, is the result of the cooperation of the historic Riva shipyard and Marc Newson, the renowned designer. It was launched as a limited edition in September 2010 and this is the first of only 5 examples made. Mr. Newson every year races one of his classic sports cars – an Aston Martin, a Ferrari and a Cisitalia, in the Italian Mille Miglia and was the designer and creator of the Mille Miglia 2018’s trophy and medals keeps on adding ambitious projects to the list of his exclusive creations. Between his recent projects are the stunning Prada Cup silver trophy, the Louis Vuitton luggages, Mont Blanc’s Ballpoint Pen, the Ferrari’s motor–inspired aluminium case of the Art & Collector’s book, a Magnum Presentation Set for Dom Pérignon, the Apple Watch. His work is housed in the collections of several major museums around the globe including the Museum of Modern Art, New York, the Victoria and Albert Museum, London, and the Centre Georges Pompidou, Paris. His work has become amongst the highest selling in auctions. One of his three Lockheed Lounge chairs sold for $968,000 at Sotheby’s in 2006, and £1,100,000 at a 2009 auction at Phillips de Pury & Company. At the 2006 Design Miami fair he produced 12 Chop Top tables, all of which sold out in 20 minutes at an estimated $170,000. In April 2015 his Lockheed Lounge chair sold at auction for £ UK 2.4 million, making it the most expensive object ever sold by a living designer. This stunning Aquariva by Marc Newson is the first example of only 5 examples which are built by Riva. The entire boat is designed by Marc Newson himself for Riva and was launched in September 2010. The Riva is in perfect condition with options including, a cockpit shower, cockpit table, life raft, swim ladder, electric windlass, bowthruster, fridge and wet bar with sink. Newson was careful to preserve the Aquarama’s streamlined nuances which adding his own finesse. The result is a classic, clean instrument panel with a wrap-around laminated glass windshield. The deck is covered with phenolic composite (a wood-like laminate characterized by durability) and anodized aluminum in lieu of mahogany and stainless steel. The Aquariva has an overall length of 10.07 meters and a 2,80 meter beam. Powered by Yanmar and reaching a total of 380 HP, the Riva reaches 36 knots at cruising speed and a top speed of 41 knots. According to the shipyard’s test results, her range is 150 nautical miles. In 2010 these hand built models of the Aquariva by Marc Newson were available for a price of € 1.000.000,- excluding V.A.T. 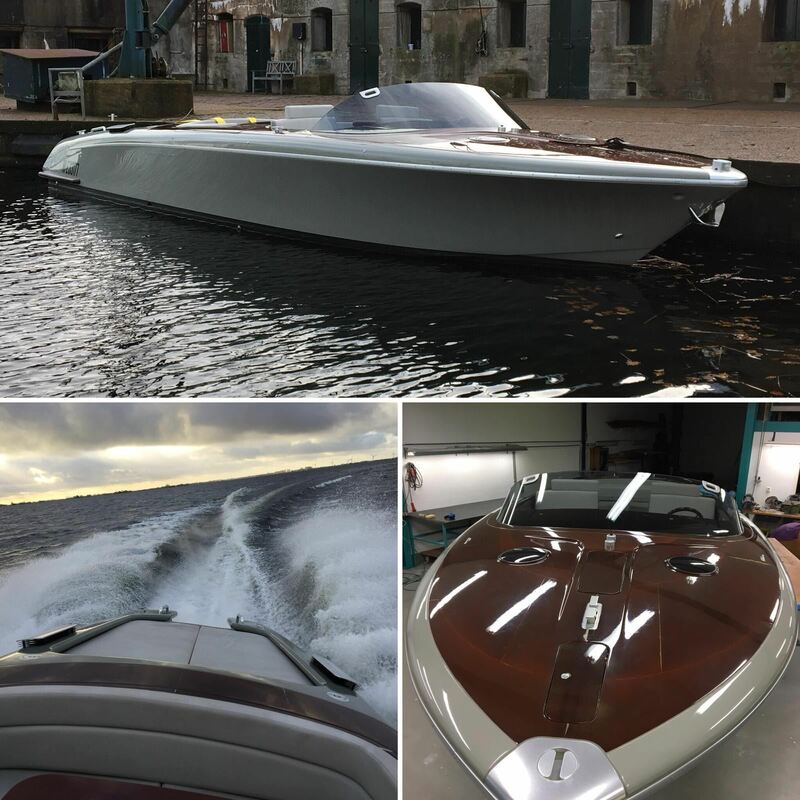 The boat is currently completely checked and updated by Riva World in the Netherlands. The boat will be ready in spring 2019. Condition wise we can be short, the boat was already in a nice condition when we bought it but we will detail the entire boat and bring it in an as new condition, interior exterior and technically wise. Without any touting and talking big, the designer and the yacht builder delivered calmly and with a sort of muzzled snobbery a sense of balanced luxury. The Aquariva by Marc Newson is an extremely rare speedboat. A unique piece of art which is very special to own and to use. The first time we drove the boat we were extremely impressed, it seemed that the boat was fast, until the moment we pushed the gas completely down. It felt as a turbo which arrived and the boat went extremely fast. The handling is outstanding. Both on high and lower speeds the boat is very easy to handle. The internet is full with articles about this very spectacular boat but it’s nice to know that this specific example was the boat which was used during the introduction whereby the host was Princess Carolina of Monaco.